The local relief efforts for Hurricane Harvey came together as a culmination of desire to assist our Texan friends and family that were affected by this disaster. As news began to trickle out about the extent of the damage caused by the hurricane, the Del Rio Parks Foundation began collaborating with community members Rachael Dimitri and Maria Perkins on a small plan to provide assistance to those affected by collecting donations. The Del Rio Parks Foundation then reached out to the City of Del Rio and Val Verde County to see what could be done to make a larger scale impact. An emergency response committee was formed consisting of members of the Del Rio Parks Foundation, City of Del Rio, Val Verde County, Del Rio Chamber of Commerce, Texas Department of Public Service, First United Methodist Church and BCFS. Collection efforts launched with a great start on Monday, August 28 at the Del Rio Community Garden. Parks Foundation volunteers received items including canned goods, baby products, hygiene items, clothing and more donated by concerned members of the community, to be sent to the Aransas Pass area. City of Del Rio staff also liaised with a gulf coast displaced family in Del Rio in order to provide them with immediately needed items. Maria perkins and Rachael Dimitri loading trailer with goods collected at the del Rio Community garden,. The emergency response committee commenced a larger-scale donation effort on Wednesday, August 30 with a very successful donation drive at the Del Rio Civic Center. City of Del Rio Government staff, DPS, Fire Department, Val Verde County, Civic Center, Chamber of Commerce and Del Rio Parks Foundation volunteers rose to the occasion to collect a steady stream of donations from members of the community, who turned out in large numbers to donate much needed supplies. Donations included water, clothing, cleaning supplies, hygiene products, diapers, canned beverages and more. The Del Rio Civic Center was a hub of activity all afternoon on Thursday, August 31 as members of the community, City of Del Rio staff, EMS, Fire Department and Del Rio Parks Foundation volunteers came together to sort and package clothing donations received from the community during the donation drives. Lunch was generously provided by Chick-fil-A of Del Rio and volunteers made sure all clothing was boxed and ready to go. A trailer, generously provided by Magico Logistics, was then filled with the donated clothing, and the donations were delivered to New Pilgrim Baptist Church, in Beaumont, Texas, on Wednesday, September 6. The first trailer loads of approximately 40 pallets worth of donated goods from the Del Rio hurricane relief efforts arrived safely in Aransas Pass, Texas on September 1, 2017, delivered to Allen Samuels Chrysler Dodge Jeep RAM - Aransas Pass, which served as a distribution and delivery hub for the Coastal Bend Area. We saw firsthand not only the tremendous amount of damage caused by the hurricane, but also the tenacity and fierce determination of everyone we met - volunteers as well as those affected Texans. Despite the circumstances, spirits were high and everyone was pitching in to help each other. The dealership was bustling with activity all day as volunteers both received donations and provided anyone who asked with goods assistance. Val Verde County Commissioner Lewis Owens and staff members Lupe Puente and Sunny Faz, along with Del Rio Parks Foundation volunteer Mike Tanaka transported and unloaded the trailer of goods in Aransas Pass. 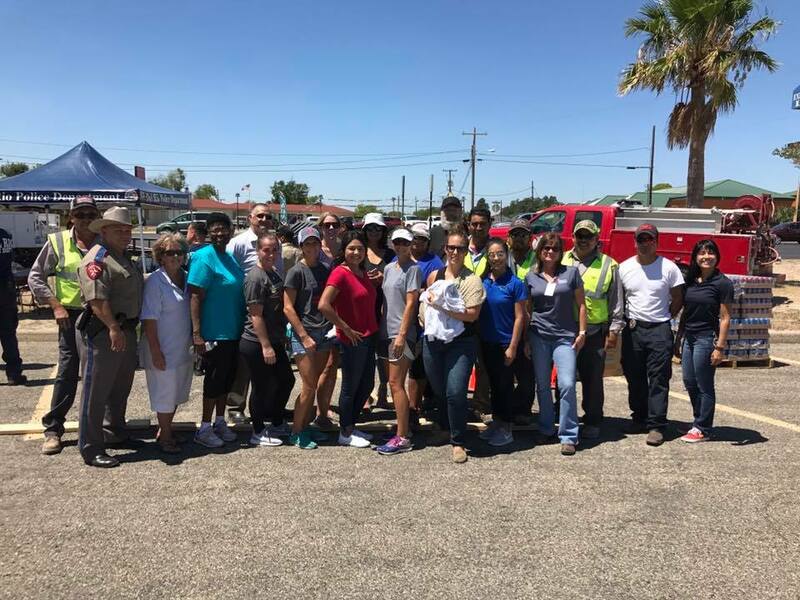 Del Rio Parks Foundation Vice-President Monica Salazar accompanied the convoy and acted as a liaison between our community and distribution center staff. A courtesy car was generously provided by Hyundai of Del Rio for the Del Rio Parks Foundation volunteers use. In addition to the county trailer, we ran into Maria Perkins of Scrappy Doodles Photography & Design who was kind enough to deliver the donated items collected at the Del Rio Community Garden as well as private donations coordinated by concerned citizen Rachael Dimitri. Rachael and Maria were both an instrumental part of the community garden donation collection and delivery planning. On Saturday, September 2, a second donation drive was held at the Del Rio Civic Center. 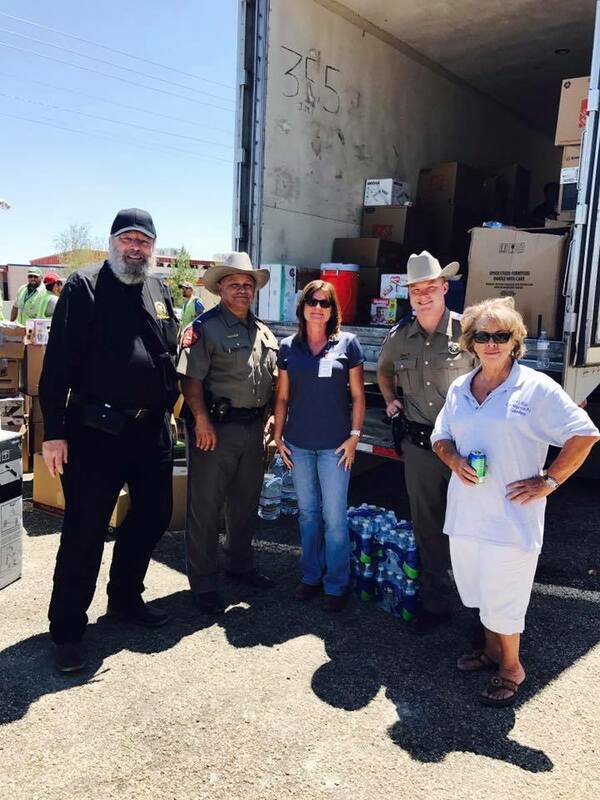 Del Rio citizens once again donated goods including, water, cleaning supplies, personal hygiene products and more. The Del Rio Rams Football team generously volunteered several hours to help sort, pallet and load 1.5 trailers of goods and clothing. $1,500 in supplies was also collected from Eagle Pass, Texas with the assistance of State Rep. Poncho Nevarez, and bulk donations were also made by the San Felipe Lions and Promise Land Church. Donated goods were palletized and loaded onto another Magico Logistics Trailer. Also generously making a bulk donation of clothing was Faith Mission of Del Rio. Our local IHOP restaurant also gave out discount meal vouchers for all those who dropped off supplies. The trailer was then driven and goods delivered to Mount Calvary Baptist Church, in Port Arthur Texas on Monday, September 10. Several small batches of items remain and the long-term recovery committee has stored those items to be made available for future needs. Since Hurricane Harvey struck, the emergency response committee has been the point of contact for displaced families staying in Del Rio. With over $3,000 in donations the committee has been able to help 16 families with financial assistance. Some families simply needed a meal or money for gas, others were assisted with housing. Families in need also received donated gift cards from H-E-B. We are overwhelmed at the response and generosity displayed by Del Rio citizens, business leaders and government agencies that supported the relief efforts, either via donation or volunteering their time. In total, around 120 volunteers donated their time and energy to all of the relief efforts, and several truckloads of supplies, clothing, water, food and other much needed items were collected to be donated. We are very thankful for this outpouring of community support and are proud of Del Rio for standing up in this time of need. We stand committed to help in the future should the need arise. DEL RIO, Texas -- Local government entities and community organizations convened again this morning to continue coordinating aid and relief efforts for those affected by Hurricane Harvey. The Del Rio Parks Foundation, City of Del Rio, Val Verde County, Del Rio Chamber of Commerce, Texas Department of Public Service, First United Methodist Church and BCFS have been working together to assess the needs of evacuees who are currently in the Del Rio area, as well as those in coastal communities affected by Hurricane Harvey. Organizers also have collected over two thousand dollars, which is being distributed directly to displaced families in the Del Rio area. The first truckload of donated goods is scheduled to be delivered to Aransas Pass, TX on Friday to a community distribution center where it will be made available to local citizens and delivered to nearby rural communities also devastated by the hurricane. Over 15 pallets of donated clothing will be delivered for distribution to affected communities within the coming days. Following the overwhelming community response to the first donation drive, a second donation drive has been scheduled for Saturday, September 2 from 11:00 AM to 1:00 PM at the Del Rio Civic Center to collect items and gift cards to aid those affected by Hurricane Harvey. Items needed include diapers, baby wipes, baby formula, toiletry items, non-perishable food, cleaning supplies, garbage bags and powdered/canned milk. Used clothing will no longer be accepted. A full list of items can be viewed below. Over 75 volunteers have assisted with the aid efforts since Tuesday and more are needed to assist with Saturday’s collection. Around 30 volunteers including City of Del Rio staff, Fire Department, EMS, concerned citizens and Del Rio Parks Foundation members assisted on Thursday with sorting and packing clothing. Lunch was generously provided by Chick-fil-A, and H-E-B donated gift cards for distribution to local families and individuals displaced by the hurricane. With rescue and relocation efforts continuing throughout Texas, the group remains prepared to provide housing and services for additional evacuees. The City of Del Rio will utilize the Joe Ramos Center for families seeking housing should it be needed. Families seeking assistance should contact the City of Del Rio at (830) 309-9215 or Hannah Hinson at (830) 775-3551. For questions about how to donate, please contact Laura Vasconcellos at (612) 850-5619. If you would like more information on becoming a volunteer with the Red Cross, please visit http://www.redcross.org/local/texas/gulf-coast/volunteer. Monetary donations through the Red Cross can be made at https://www.redcross.org/donate/hurricane-harvey. We are asking that the public kindly refrain from donating water or used clothing at this time. DEL RIO, Texas -- Local government entities and community organizations convened this morning to coordinate and execute aid and relief efforts for those affected by Hurricane Harvey. The Del Rio Parks Foundation, City of Del Rio, Val Verde County, Del Rio Chamber of Commerce, Texas Department of Public Service, First United Methodist Church and BCFS met to assess the ongoing situation in the coastal communities affected by Hurricane Harvey. The group acknowledged that efforts are part recovery and part preparation as the situation in the Texas Gulf Coast continues to evolve. A donation drive has been scheduled for Wednesday, August 30 from 11:00 AM to 1:00 PM in front of the Del Rio Civic Center to collect items and gift cards to aid those affected by Hurricane Harvey. Items needed include diapers, baby wipes, baby formula, toiletry items, non-perishable food, laundry detergent, cleaning supplies, garbage bags, water, and new/unused blankets, towels, shoes, clothes and pillows. A full list of items can be viewed below. Gift cards are also being requested and donors are encouraged to donate in bulk when possible. With rescue efforts continuing in Houston, the group will also be preparing to provide housing and services for additional evacuees. The City of Del Rio has opened the Joe Ramos Center for families seeking housing and have plans for additional shelter locations should they be needed. Volunteers are also needed to help inventory, sort and pack donations and should check-in at the Del Rio Civic Center front parking lot at 10:00 a.m., or they may email emeza@cityofdelrio.com to register as a relief volunteer for future needs. Organizers are also looking for a donation of new or unused boxes to store and sort donations. Those seeking shelter or in need of donated items may contact the City of Del Rio at (830) 309-9215 or Hannah Hinson at (830) 775-3551. For questions about how to donate, please contact Laura Vasconcellos at (612) 850-5619. The Greater Houston Community Foundation connects donors with a network of nonprofits and innovative solutions in the social sector. United Way of Greater Houston maintains a disaster relief fund but anticipates the needs of Harvey will far exceed those existing resources. Alfred Lozano, City of Del rio emergency management, discusses plans for donation allocation in the city of del rio.